Now that we’re dying to bust out our brightest summer lip colors, the time has come to deal with one of our perennial beauty complaints: chapped lips. Even the fanciest lipstick looks patchy and sad when worn on a dry kisser; plus, peely lips? They freaking hurt! 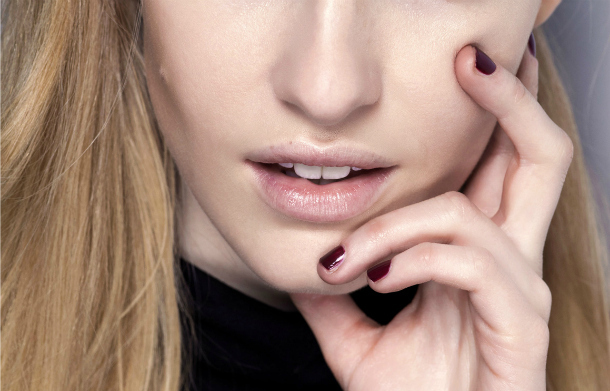 So what actually causes chapped lips? It turns out there are thousands of factors conspiring to sap your kisser of moisture. We’ve rounded up seven of the biggest, baddest lip-chapping culprits—as well as our proven ways to beat them. You’ll thank us the next time you’re making out, we promise. 1. Licking and biting your lips. Save it, Anastasia Grey. These habits are responsible for a vicious cycle of lip chapping: you lick your lips to moisten them when they’re dry, the saliva evaporates and dries out the delicate skin of your lips, which causes them to peel, which causes you to bite at the loose skin, which starts the entire process over again. Stop the madness! The cure: Unfortunately, the only way to break this habit is to…well, break the habit. Stopping licking and nibbling at your mouth is hard, but inspire yourself to greatness by thinking of all those amazing matte lipsticks you’ll be able to wear afterwards. And avoid any lip balms that are scented or flavored— just tempt you to nibble more. We’re killing our kisser year-round. In winter—which we barely survived—you’re swaddled in layers of down and cashmere like a glamorous Randy from A Christmas Story, but your poor lips are still exposed to the freezing elements. And in summer, while you slather the rest of your body in SPF, too often you forget to protect your mouth from the sun. The struggle is real. Short of moving into a temperature-controlled bank vault, what’s a girl to do? The cure: An ounce of protection is worth a pound of cure, so make sure you’re getting really liberal with your lip balm. But you also have to be sure you’re being smart ABOUT that balm, making sure it has ingredients that heal and nurture, rather than just coat with wax. Kiehl’s Lip Balm #1 ($7) is a dermatologist favorite for protecting lips damaged by even the most inclement weather. Blistex Medicated Lip Balm ($1.79) is also fantastic, coming in a wide range of flavors while also offering a really stellar SPF—essential for all the summer loving we plan to do. The worst! Not only do they make you feel miserable, they also mess up your beauty game. And nasal allergies—you know, the kind that leave you breathing through your mouth—have the horrible, accidental side-effect of drying out your lips. Gross. The cure: First, you need to talk to your doctor. Allergies are serious business, and addressing the underlying problem is critical to dealing with beauty issues. In the meantime, your best bet is a two-pronged approach: protect at night and exfoliate during the day. Keeping a nourishing lip balm next to your bed, so that you’re sure to apply it before going to sleep (and during the night, if you wake up). And when you wash your face (morning and night, everyone! ), use a cotton washcloth and warm water to gently exfoliate away any chapped skin on your lips. Stick to this routine, see your allergist and your chapped lips will look better in short order! Here’s where we tell you to DRINK MORE WATER! If you’re drying out internally, one of the first places you’ll notice external changes is your lips, because the skin is so thin. The cure: Drink. More. Water! How much should you be drinking per day? Here’s the definitive answer! Like so many things in modern life, the things that cure one of our problems can also create others. Medications like accutane, prescription-intensity Vitamin A and prescription retinoids like—Isotretinoin—can all cause or exacerbate your chapped lip situation. The cure: Talking to your doctor. Chapped lips (often called “cheilitis” in prescription information booklets, so look out for that) are sometimes such a rare side-effect that it isn’t listed, or isn’t listed prominently. Your prescribing health professional will be able to help you out, and possibly point you in the direction of medical-grade lanolin, which is aces for healing even the most severe chapped lips. If you’re allergic to this common metal, believe it or not, you may first see it on your lips. People often put common items like earrings, keys or paper clips in their mouths, which can cause a skin-peeling allergic reaction on (or around) the lips. Crazy, right? The cure: Get tested for a nickel allergy, and quit putting stuff that isn’t food in your mouth. Okay? Okay! Even the most awesome offices in the world suffer from terrible air situations. The crazy heat and air conditioning situations common to many workplaces play merry hell with our skin—which means our lips, too. Who knew that chapped lips might also be related to our 9-5? The cure: Two words that are going to change your life: miniature humidifier. You may not be able to control the climate of your office, but a travel-sized humidifier at your desk will make all the difference in the world. This one plugs into your laptop and looks like a coffee cup; this one is easily portable and quite chic; this one is a bit bigger (which is great for open office spaces) but contains enough water for a full eight-hour work day. More from Daily Makeover: Fermented skincare is the hottest new beauty trend.